The easiest peanut butter granola with no oil and no refined sugar! Just 5 ingredients, 10 minutes of prep, and 30 minutes to make. A healthy vegan breakfast, snack, or dessert! 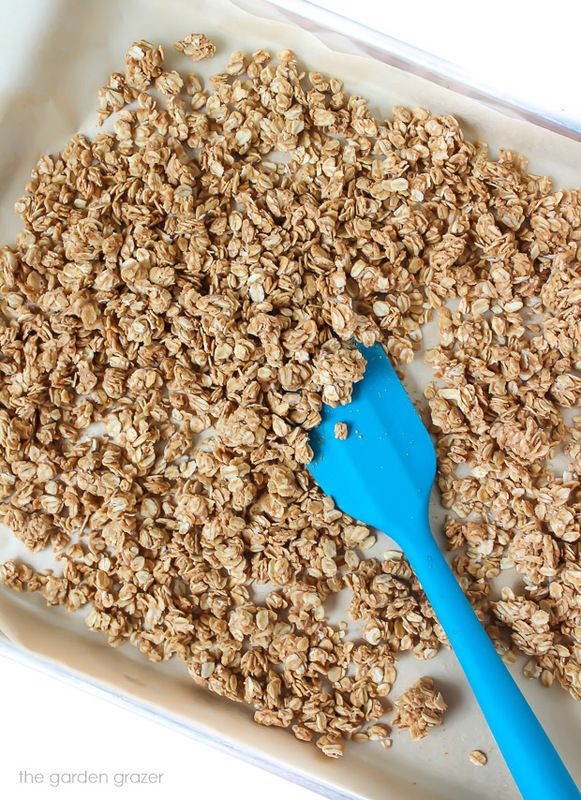 My idea for this recipe was to make a super easy oil-free granola… and I love how it turned out! Only 5 ingredients, no refined sugar, and only about 10 minutes of prep. It’s naturally sweetened with maple syrup and hints of cinnamon & vanilla. Most granola recipes call for quite a bit of oil, but I found the natural oils in the peanut butter worked great. 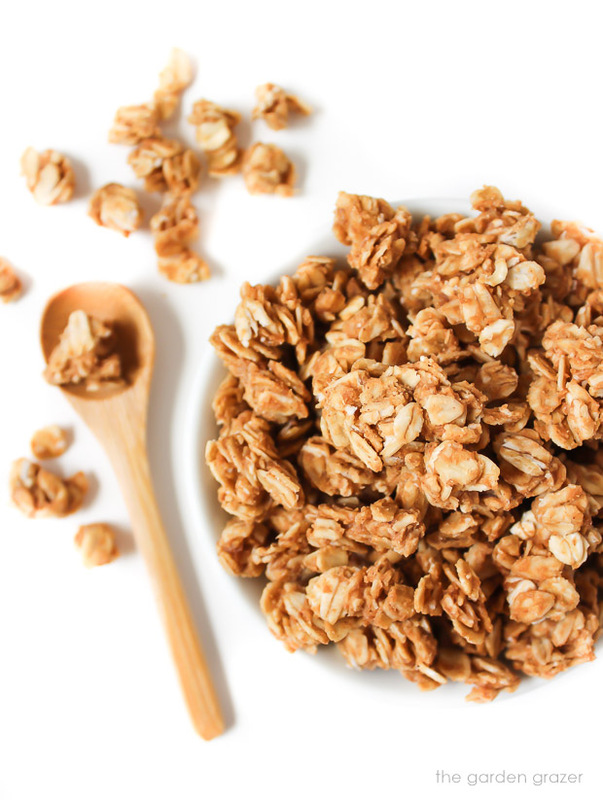 Feel free to adjust the sweetness however you like – I use 1/4 cup maple syrup for both sweetness and it helps create delicious chunky granola clusters. It’s great for breakfast, snacks throughout the day, or even dessert! Hope you enjoy as much as we do. Come join The Garden Grazer on Instagram 🍓 and share a pic if you give it a try! I love seeing what you guys cook up. Dairy-free chocolate chips, dried fruit, coconut, etc. In a medium saucepan over med-low heat, add peanut butter and maple syrup. Heat for about 4-5 minutes, stirring occasionally. When melted, remove from heat. Add vanilla and cinnamon. Stir. Add oats and stir well to thoroughly combine. Add a pinch of salt if desired. Bake for about 20 minutes, stirring halfway through. Remove and let cool. Made gluten-free with gf oats. 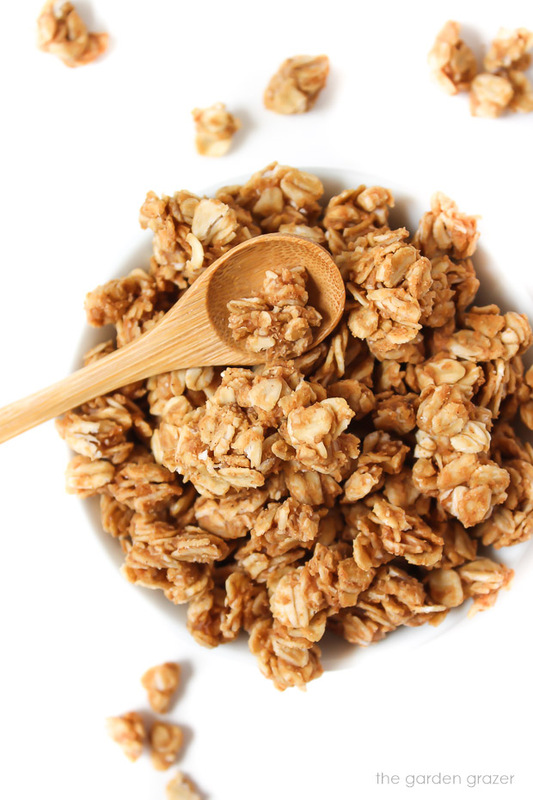 Granola will be soft when it comes out of the oven, but it gradually hardens as it cools. After it completely cools (about 25-30 minutes), I store it in a sealed glass jar in the fridge. Ours usually disappears within a week, so any storage past that I’m not sure! Adjust the sweetness as desired (more/less maple syrup). I find about 1/4 cup is the sweetness I like, plus it helps create the crunchy clusters! Did you make this recipe?Tag @thegardengrazer on Instagram and hashtag it #thegardengrazer. I love seeing your recreations! 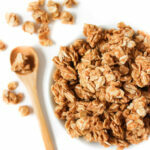 This was an amazing granola and so easy too. My granddaughter loved helping and gobbled up a bowl full when it was done. Thank you. I don't have natural peanut butter. Will Skippy work, or do I need to adjust the other amounts? I have a peanut allergy, wondering if sun butter would work well in this recipe. Do you know of anyone substituting with other butters and how it turned out? It sounds amazing! Hi Julie! I haven’t personally tried other nut butters with this yet, but I’m guessing sun butter (or almond, cashew, or a blend of any of these) would work well! My husband has actually been making this recipe a lot lately, so I’ll tell him to experiment and will update with our findings 🙂 Would love to hear if you give it a try too! Have a beautiful week! *NEW! * Did you make this recipe? Please rate it!